BACTIGARD is a 10% solution of Povidone iodine (PVP-I), an iodophor complex consisting of iodine and carrier polyvinylpyrrolidone (PVP). Its antimicrobial effect is identical to free iodine. It is potent against gram-positive and gram-negative bacteria, TB bacillus, fungi and viruses. It is also effective to a certain extent against spores. Binding the free iodine to PVP makes it a less irritating solution and also allows the film formed on the skin to be removed completely by washing with water. 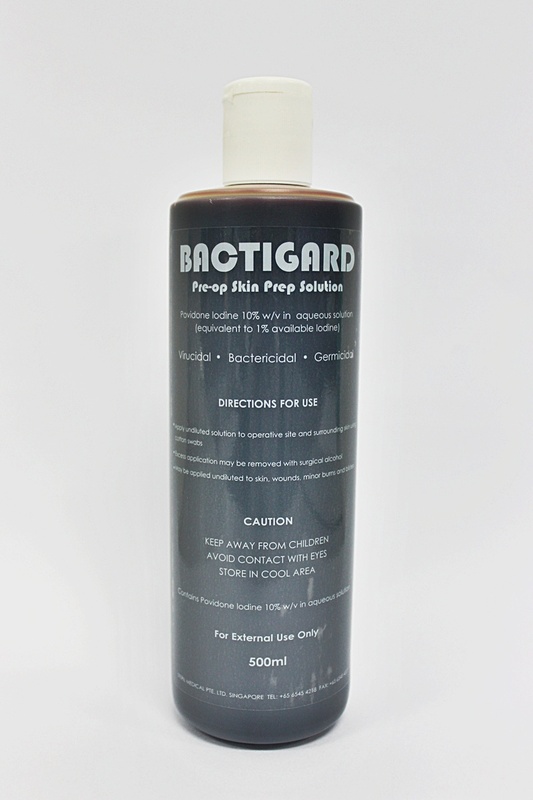 PVP-I is recommended for painting the skin for final preparation of the skin prior to surgery. It also helps the surgeon to define the pre-operative site. SKU: HUN 10 00 04. Category: STERIL Solutions.